It's our the final day of our trip so we go for a little posh nosh, some yum cha in a Casino, the Old Lisboa in the gambling mecca that is Macau. Well it's not too posh, it's mainly families enjoying Sunday yum cha and old blokes reading newspapers. We love the way it's done at a leisurely pace, this is downtime Macau style. The Old Lisboa, not to be confused with the New Lisboa, is a yum cha intiution in Macau. Almost as famous as the 'shark tank', the circular mall below, where very friendly ladies walk endlessly around and hope they can take someone home for, ahem, a cup of tea. After we've ordered the rice crackers arrive, light and crisp with a little chopped pickle vegetable for a side taste. Chilli and sesame paste and crushed chillis for dipping come too. Steamed scallop dumplings with conpoy (dried scallop, thanks Wikapedia!). Steamed rice flour roll with preserved vegetables and BBQ pork. Slippery, slidey, beautiful. Steamed Ducks tongue with dried tangerine peel. We've always wanted to try duck's tongue, though we probably won't again. It has a surprise little bone inside, not much flesh. The tangerine provided a perfect citrus taste. Baked stuffed clams with pork meat in ginger juice. Steamed pork dumplings with basil and crab roe. Crab roe was a great new favourite on this trip. Steamed rice flour roll with shrimps and bamboo piths. Pan fried buns with pork meat Sichuan style. Baked chicken fillet with shrimp mousse and sesame. Each plate was so differently presented - I loved the gold nanna doily on this one. Half time break... Make sure you visit the magic no hands needed to get in bathrooms. The place is jumping and jiving Macau style by the time we leave. The only way we got a table is if we promised to be quick and not hang around! After our yum cha it was a last chance to look at the old town. This place still holds on to the Portuguese roots, but it feels more like a theme park than real heritage. There's thousands and thousands of daytrippers from Hong Kong and mainland China wandering the around and eating. Oporto's or Nando's would clean up with a branch here. Portuguese tarts - about 70c each. Buy five like us and eat till you burst. Or try the 'shark tank' for more tarts. There was a queue here not only for the tarts but a great looking pork chop roll as well. We just couldn't fit it in and will be back to try next time. The tart had a lot more buttery puff pastry than a Petersham one, and wasn't as burnt. More like a chinese custard tart. We must admit we prefer the Petersham version. Lots of day trippers come to Macau for the sweeties. There are whole alleys of sweet shops, mostly with crunchy peanut candies. You can taste quite a few on the way to the famous old church. We caught the ferry directly back to Hong Kong Airport from Macau. Our last meal was a simple wonton noodle soup at the airport. Perfect. 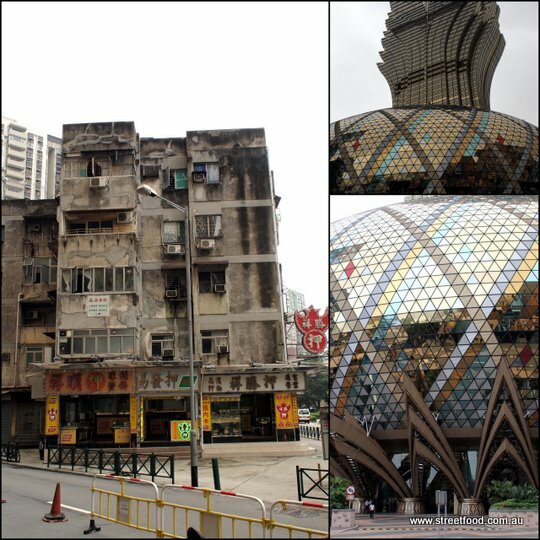 we love macau, so sleepy or so crass, would love to spend 3 months there just poking around. the steamed rice cakes at yum cha looks great. love that gaudy, grand lisboa casino!